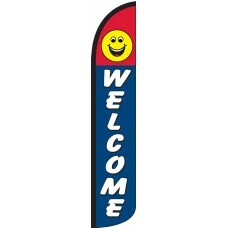 Welcome prospective customers to your business with our wind-free Welcome Feather Flags. We offer two designs to fit the motif of any business. 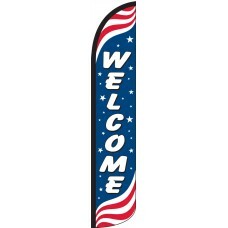 Our most popular Welcome feather flag is our patriotic design which matches our patriotic themed flags that are available with many different messages. Our smiley face flag matches many of our designs the feature red and blue designs. Welcome customers to your business regardless of the weather because our wind-free style flags stay fully visible even with no wind.